Remember my "bird food" entry dated 10 Feb 2011? 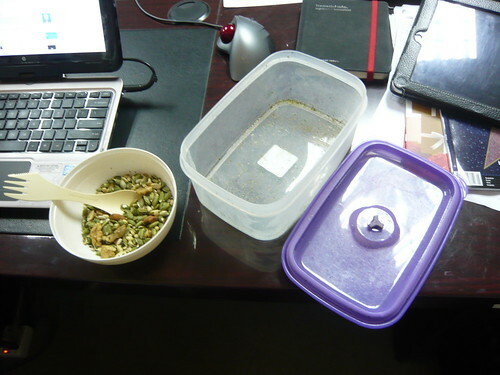 Well, exactly one month later on 10 Mar 2011, I ate my last scoop from the tupperware. Yeah, one month's worth of lunches taken care of by the little humble tupperware. Well, to be honest, not exactly 1 whole month considering the fact that I have days where I am not in the office during lunch time (weekends, business trips, lunch appointments, etc). Still in any case, it was a delightfully healthy lunch plan and I was never once sick of them. 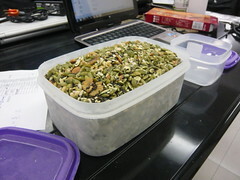 I guess that fact that I love seeds and nuts helped. On hindsight, it was a right decision to invest in a good quality tupperware that I was able to seal them in tight. Storing the whole tupperware in the refrigerator probably helped too. Time to take a break from the seeds and nuts in the interim while I make a trip to Hong Kong to stock up.